After all, the kitchen is the heart of the home and should further our healthy lifestyle, not hinder it. Yet in many homes convenience continues to trump health, with kitchen pantries and cupboards better suited to storing canned goods and packaged foods than fresh fruits and vegetables. 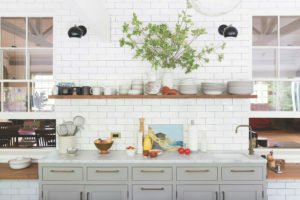 At first glance it may seem as though kitchens are being continually reinvented – just consider the scores of magazines devoted to showcasing new layouts and designs. In reality, little has changed beyond the surface in the past 65 years. New cupboard styles, flooring materials, and counter treatments offer only a fresh wrapping on the same package. Veronica Schreibeis, Chair of the Global Wellness Institute’s Wellness Architecture Initiative and CEO and Founder of Vera Iconica Kitchen, spoke of this while giving her keynote speech at the 2017 Global Wellness Summit. She explained that the kitchen most of us know today evolved in the wake of World War II. The war drew a record number of women out of the kitchen and into the workforce as they secured jobs typically reserved for men. 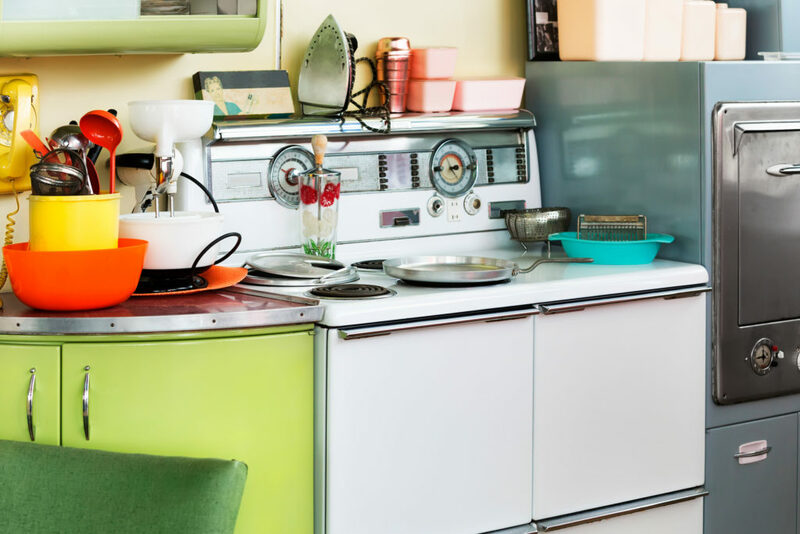 Processed foods, microwave meals, and TV dinners filled the void left by an absent housewife no longer spending hours a day preparing meals from scratch. Why deal with the hassle of fresh ingredients when a tray of unhealthy and preservative-laden food could be quickly reheated for a “family” meal in front of the television? The old eating and lifestyle habits of the 1950s, however, are rapidly and thankfully becoming history. Today, more people than ever before understand the correlation between what we eat and preventable diseases like obesity and diabetes, and recognize that eating nutrition-laden foods is the cornerstone of a long and healthy life. These informed consumers are willingly adopting a living, locally-sourced, fruit and vegetable-rich diet free of preservatives and chemicals. In recent years, the popularity of organic food has exploded, and what was once seen as the province of health food stores and hippies is now both in vogue and in demand. The United States Department of Agriculture (USDA) reported that consumer spending on organically produced goods continued to show double-digit growth in 2017, with organic foods now available in three out of four conventional grocery stores in the U.S. The USDA also noted that mainstream consumers increasingly prefer organically produced food, largely due to concerns about their health, the environment, and animal welfare. And, while organic goods typically cost more than foods grown with chemicals and fertilizers, consumers don’t mind paying more for these products. Among organic foods, fresh fruits and vegetables are the top selling category, with produce accounting for 43 percent of organic food sales. This trend is hardly confined to the United States. In 2014, for example, the market for organic products in Europe increased by 7.4%, more than doubling the average annual growth rate (2006-2012) in grocery retail markets.2 The Transparency Market Research Report predicts the market for organic food will continue to expand at a healthy rate around the world, especially in developed regions. Simply put, people care more about the freshness and quality of their food, and our kitchens will increasingly be designed to store and even showcase fresh, organic products. 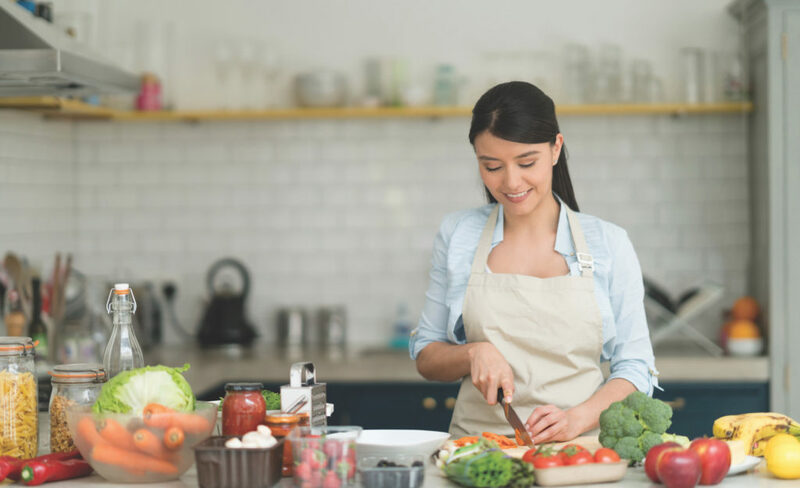 Much like the organic food itself, Wellness Kitchens are an investment in one’s health. What does all this mean for the Wellness Kitchen? In the future, as more people come to value fresh produce and plant-based foods over animal products, they will seek out kitchen designs that explicitly support their lifestyle. People have been purchasing fresh food from outdoor markets for centuries, long before the term “farm-to-table” cropped up on menus and magazines. Regardless, it has become the buzzword of the day, used to describe the rising demand for buying organic (and healthy) just-picked fruits and veggies, locally raised meats, and fresh fish at local farmer’s markets. To understand the scope of the farm-to-table movement in the Western world, consider that there are over 500 farmers’ markets in the UK alone, and the U.S. is home to over 8,000 farmers’ markets, with more popping up every year. At the same time, home delivery of organic produce is also on the rise, with dozens of organizations such as Farm Fresh To You and Imperfect Produce vying for a growing consumer base. More people are also growing their own food at home or in community gardens (35% of all households in America in 2014). The largest increase has been in younger households, up 63% to 13 million since 2008. In short, counting calories is out and all-natural nutrients are in – just ask any savvy food blogger what happens to their view count when they add the word “SuperFood” to a post. Once harvested, however, fresh, living food needs to be carefully stored in an environment that doesn’t bleed off its nutrients. For example, fruits and vegetables can lose as much as 50% of their Vitamin C and other nutrients if stored improperly. And to complicate matters, not all fruits and veggies get along: e.g., cucumbers don’t like cold temperatures; celery and carrots like water; and because fruits produce ethylene gas, which acts like a ripening hormone, fruits and veggies often shouldn’t be stored together. Unfortunately, traditional refrigerators and dark cupboards and pantries are often designed to store pre-packaged, non-living foods. That’s why consumers will look for new solutions in the future. More consumers than ever before are conscious of and concerned about not just their own health, but the health of the planet. Environmentalism impacts our everyday life, rituals, and choices, from the socks we buy to the roof over our head. And this trend is a global one, especially strong in Europe, Canada, Asia, and the U.S. Wellcertified.com, launched in 2013 by the the International WELL Building Institute, is considered the premier standard for buildings, interior spaces and communities looking to implement, measure, and validate features that support and advance human health and wellness. Today there are scores of building materials and designs for human and regenerative health. And easier access to environmental information has dramatically influenced the kinds of materials and products consumers are choosing for their homes and kitchens. 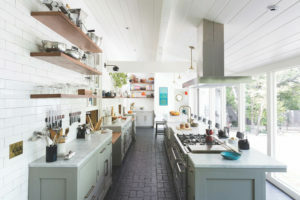 The kitchen most of us know today evolved in the wake of World War II with kitchen pantries and cupboards better suited to storing canned goods and packaged foods than fresh fruits and vegetables. The kitchen of the future serves as a sanctuary, not a pressure cooker. Cupboards and shelves packed with redundant and elaborate appliances are being replaced with bowls of organic fruit, drawers of fresh veggies, and natural ingredients for easy-to-prepare meals. give us instant “…access to transportation, accommodations, food and all the things we need in our daily lives.” This sharing economy will generate $335 billion in global revenue by 2026 according to PricewaterhouseCoopers. This new “less is more” trend is a major component of the Wellness Kitchen. When it’s time to cook a special meal, kitchen equipment can be delivered within minutes, borrowed from a friend, or requested on community sites like NextDoor.com. Whether it’s a sous vide machine or a tagine pot, it will all be at a home cook’s fingertips without cluttering his or her cabinets. But what exactly is the Wellness Kitchen? The term itself was first coined by Ms. Schreibeis to describe a wide range of design decisions all made with wellness in mind. Food storage, preparation, cooking, consumption, and disposal are reengineered to cater to fresh food and living, organic ingredients. This trend, however, is more than just healthy eating. An ideal Wellness Kitchen also feeds the mind and soul thanks to elegant, visually satisfying designs that encourage social interactions and environmentally friendly lifestyles. Open shelves exposing everyday kitchenware make room for plants. Design by Rachel Allen. Photography by Jessica Comingore. Retailers have long known that if a shopper can’t see a product, he or she is less likely to buy it. And that simple logic extends to the food we choose to eat. In the Wellness Kitchen, you can see crisp veggies and colorful fruits through your glass refrigerator door, rather than having them tucked away in an opaque crisper drawer. Or, even better, that produce is growing right there in your kitchen garden, turning your home into a vibrant ecosystem. With a Wellness Kitchen, the emphasis is always on keeping food alive – whether growing or dormant – and easy to access. 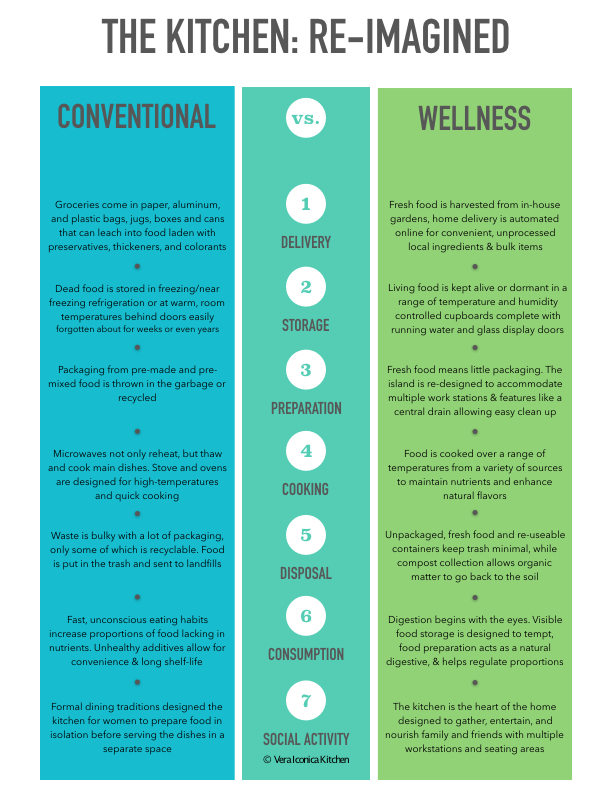 As the chart above shows, consumers also need more options for climate-controlled storage of fresh foods with a range of temperatures and humidities that keep food well organized and visually tempting. Refrigeration in the ideal Wellness Kitchen features glass doors and shallow shelves for easy visibility, multiple compartments for optimal preservation conditions, and even hidden refrigeration compressors to cut down on noise pollution. That “stuff” includes fewer appliances and less bulky equipment. Why have a bread-maker, pasta-maker, two types of blenders, a waffle iron and a crepe cooker jammed in your cupboard when you can just rent or borrow kitchen equipment when, and if, you need it? Allen agrees that wider trends toward minimalism directly translate to kitchen design. “People are replacing upper cabinets with open shelves so they can see spices, living herbs, and plants. The new design is more like a commercial kitchen with open space and areas that accommodate several people working or socializing at the same time.” Walls are being pushed back, windows enlarged, and clean lines extended to create a room that feels as much a home for people as it does for produce. A cool-toned color and material palette compliments a dark brick floor. Design by Rachel Allen. Photography by Jessica Comingore. Minimalism in the kitchen can even be seen in smaller dish sizes, as people grow aware that plate size can directly correlate to eating more. Since the early 1900s, the size of a typical dinner plate in America has become 25% larger or more. In the 1960s, plates were approximately nine inches in diameter while today dishes are often 12 inches or larger. And as dinner plates grew, so did meals and calorie counts. Thankfully, well-inclined individuals are working to reverse this trajectory. According to the UK’s Daily Mail, authors of the British Medical Journal estimated that reducing the size of a plate or bowl would decrease food intake by 159 calories a day, a 10% change for a British adult. Open floor plans, kitchen islands, and other design elements that encourage communal activities have been a staple of modern kitchens for years. In the new Wellness Kitchen, however, these ideas take center stage. More thought is given to seating and prep spaces and how they can be organized for the easy flow of both people and conversation. For example, the addition of adjustable surfaces allows people of different heights and abilities to work and socialize together. Of course none of this socializing matters if people can’t hear one another, and so Wellness Kitchens seek to design spaces that minimize unpleasant noises. Hand tools and simple appliances are making a comeback as people look to avoid the incessant whine of electric motors. At the same time, more people recognize that tasks like chopping vegetables or kneading bread by hand can itself be an exercise in mindfulness. A 2015 study by the Harvard T.H. Chan School of Public Health, the Center for Health and Global Environment, SUNY Upstate Medical University, and Syracuse University9 confirms that people working in well-ventilated offices with below-average levels of indoor pollutants and carbon dioxide (CO2) have significantly higher cognitive function scores than those who work in offices with more typical levels. Kitchens are no different – a healthy building helps foster healthy people. The garden of a Wellness Kitchen plays its own important role in ventilation, removing CO2 from the air and replacing it with oxygen, allowing family members to literally breathe easier. Rachel Allen agrees that awareness of air quality is also driving a demand for hoods and ventilation systems large enough to filter out particulate matter from the air. And while a desire for well-ventilated spaces, free of pollutants and CO2, is still strongest in commercial and multi-family residential buildings, it’s growing in importance for the construction of single-family residences. The “Future Kitchen” designed by the students of the Industrial Design department at Pratt Institute under the creative direction of Visiting Assistant Professor of Industrial Design at Pratt and New York based architect and designer, Marc Thorpe. Photo credit: Wanted Design. She recommends that people look carefully at products used in cleaning and building that may contain VOCs (volatile organic compounds) or other potentially toxic compounds. Examples include composite woods that may contain hazardous compounds such as formaldehyde or products that may contain polyvinyl chloride (PVC), which is a synthetic resin made from the polymerization of vinyl chloride. Consumers are also asking how the material or product will be employed, especially in the kitchen. For example, will it be touched, eaten from, or used to prepare food? These considerations make environmentally friendly materials popular, and there is a growing demand for recycled glass, wood and stone. The trend is to build green but not new, re-using and recycling natural materials rather than starting from scratch. As Wandzilak notes, “There is now more thought going into what is in kitchen surfaces and cleaning products. Natural wood and stone will likely contain less toxic substances than plastic. And healthy cleaning products are now available that achieve the same results in an environmentally friendly way.” However, she cautions that we should also watch for a decidedly less positive trend: green washing or wellness washing. This occurs when products or policies are deceptively marketed to promote the false perception that they are environmentally friendly. Just because we’re finished with a meal doesn’t mean a Wellness Kitchen is too. Disposing of food waste in a responsible and environmentally friendly manner is a key issue for those pursuing more sustainable lives. The vast amount of food that is wasted around the world makes this a pressing global issue, with food disposal pushed to an environmental tipping point. According to the United Nations, approximately one third of the food produced in the world for human consumption every year, roughly 1.3 billion tons, is lost or wasted – a sobering statistic. And fruits and vegetables, plus roots and tubers, all of which can be composted, have the highest wastage rates of any food. In response, the composting industry continues to expand. More individuals are looking for solutions to compost organic matter and recycle it as a fertilizer or soil amendment. In fact, the United Nations named 2015 the “Year of International Soil.” Ideas that integrate and simplify composting and recycling are an important element of Wellness Kitchen design. Schreibeis suggests that innovative food prep solutions, such as a counter equipped with convenient ways to swipe debris into proper receptacles for quick cleaning and recycling, will become a key element in the reimagined kitchen. One hypothetical appliance imagined by Schreibeis is the FroPost, which flash freezes compostable materials, allowing for easy, odorless disposal of food waste. 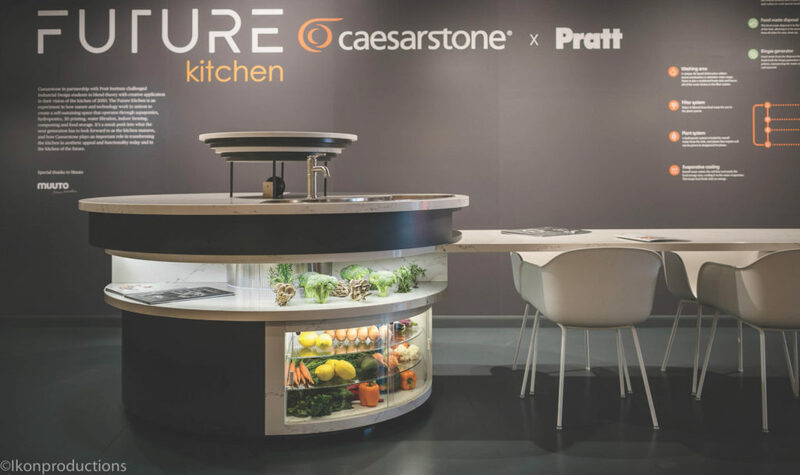 Thanks to Caesarstone, a developer and manufacturer of premium quartz surfaces, we don’t have to rely on our imagination to envision the kitchen of the future. Under the guidance of Marc Thorpe, Visiting Assistant Professor of Industrial Design at PRATT Institute, students in the industrial design department researched and devised futuristic kitchens that took into consideration such modern concerns as smaller spaces, changes in consumption habits, waste disposal, water conservation, new technology, and the transforming role of the kitchen in general. A model of the winning design was produced by Caesarstone and exhibited at WantedDesign Manhattan during NYCXDesign in May of 2017. This innovative design centers on a circular hearth, reminding us that the kitchen is as much a social meeting place as it is a space for preparing meals. The hearth’s opening doubles as a food waste disposal chute that feeds the biogas generator and 3D printer, repurposing waste into energy and recycled materials. The washing area uses stream automation to minimize water usage, and water drains into a filter system that repurposes wastewater into hydroponic and aquaponic systems. Finally, a food prep area features induction cooktops with smart technology, all encircled by – of course – elegant Caesarstone quartz. There will be more well certifications and greater emphasis placed upon mindful materials. Lists of materials in building products will be displayed just like nutrition labels on food products. Particulate and oxygen sensors will become widespread. Kitchens will set aside space for sprouting and indoor gardens. Design features will continue to pay deference to the social rituals of making food. The loudest noise in the kitchen will be conversation. Noisy appliances will become a thing of the past as we return to food prep that is mindful and relaxing. Composting and compost delivery systems will become standard features in the Wellness Kitchen. They will also be available to households in urban settings. Sinks and refrigerators will continue to be reimagined, making it easier to prep, maintain, and find fresh food. Digital technology, such as toilets that analyze urine and waste to indicate which nutrients you need more of, will become readily available. That information can be translated into recipes automatically displayed on your laptop or smart phone. Purchase and delivery can also be automated, and artificial intelligence can calculate what to cook for a group of people whose personal biomarkers all indicate varying needs. Kitchen design will easily accommodate people who are living in a shared space and have different food and lifestyle habits. Ultimately, the Wellness Kitchen of the future can mean many things to many people. For some it is a warm, communal space, full of light, fresh air, and the sounds of friendly conversation. For others, it is a temple to healthy eating, with living gardens, centrally displayed fresh produce, and easy composting. But, for all of us, it is a testament to the idea that the most important room in our house should be a reflection of our values and lifestyle. And the ways in which new innovations in kitchen design will make that a reality is always food for thought.